Fall makes me start to crave rich, warm comfort food. 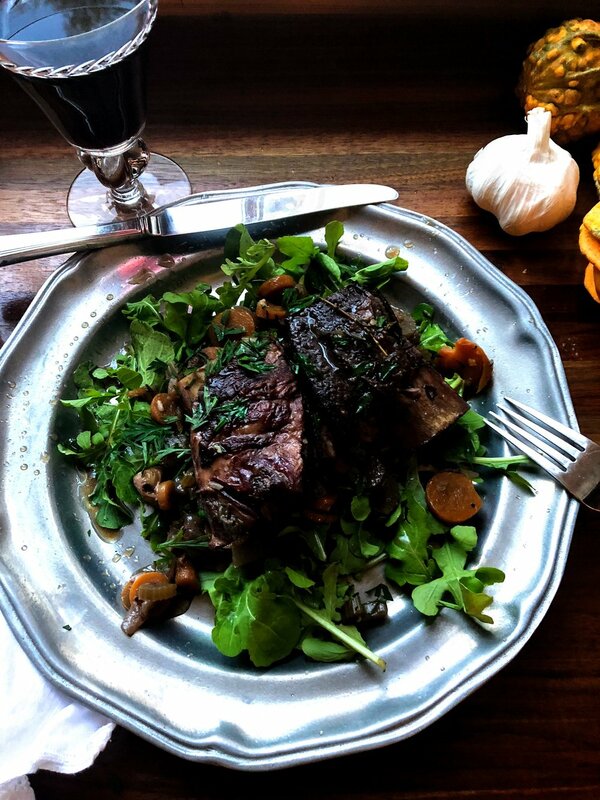 Nothing fulfills this craving better than slow cooked beef short ribs. Some of you may not be familiar with short ribs. Beef short ribs are the equivalent of spare ribs in pork, with beef short ribs usually larger and meatier than pork spare ribs. They come from the lower part of the rib right behind the cows elbow. The upper rib is where you get prime rib roasts and rib eye steaks. Short ribs are well marbled and tender when slow cooked and have an incredible depth of flavor mostly due to the flavors of the rib bone. There are a million ways to cook short ribs but, as usual, I like mine simple with few ingredients so you don’t have to drive all over creation finding everything. We are lucky to have access to very high quality beef in Warren County via Five Oaks Beef and their short ribs are AH-MA-ZING as are their other cuts. Their cattle are raised humanely on pasture their whole lives, as cows should be, and are never fed growth hormones, steroids or feed based antibiotics unlike most of what you get in grocery stores. Doug and Linda Knudson have figured out the recipe of raising healthy, happy cows that have incredible flavor. It is a real luxury to not only be able to support a local farm but you really do get the BEST product. The Five Oaks Beef website gives you all the information on how to purchase from Doug and Linda. They also are part of the Warren County Growers Farmers Market and their beef is served at one of of our favorite local restaurants, Robinson’s Ferry. So now pour yourself a big glass of red wine and let's get cookin! Sprig of thyme or rosemary or sage or all three! Pat short ribs dry, season with salt on all sides. In a medium-large dutch oven or stock pot on high add oil or butter and sear until well browned on all sides in batches if needed. Remove from pot and set aside. Turn heat to medium, add more oil or butter and onions. 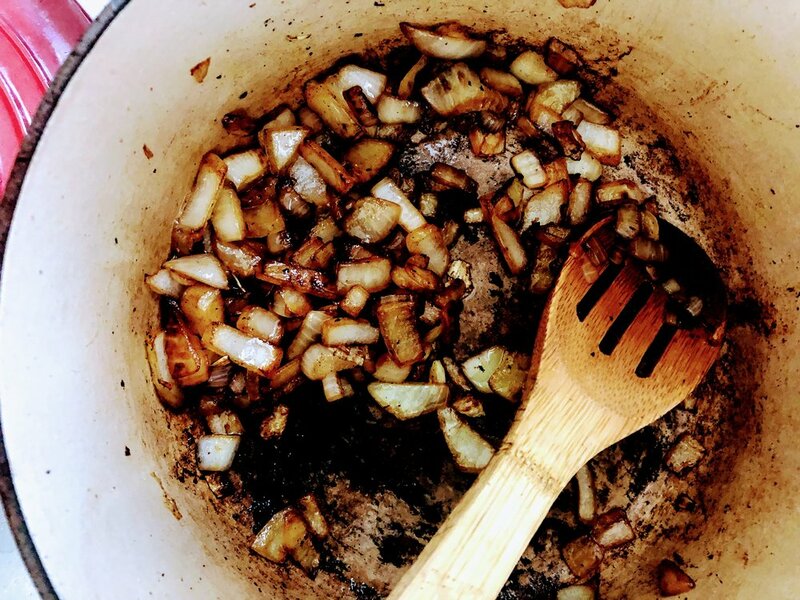 Cook until caramelized, stirring frequently. 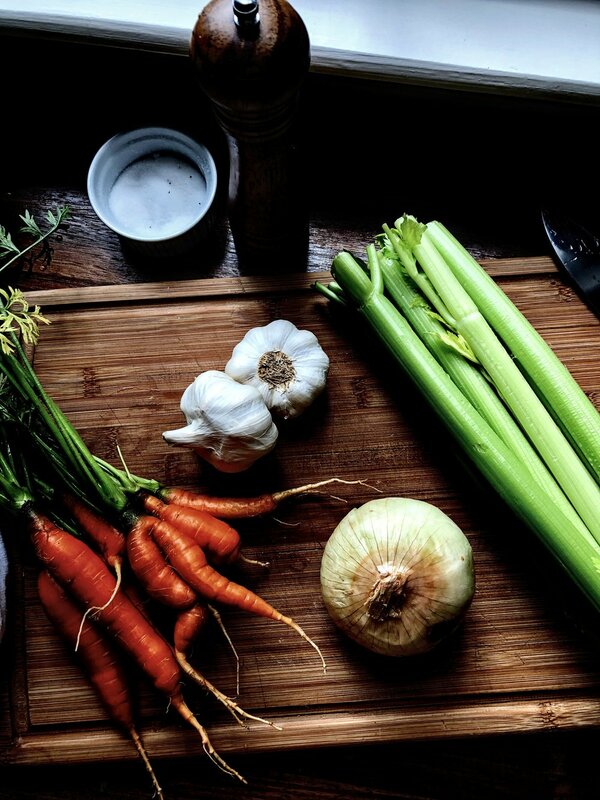 Add garlic, celery and carrots and cook until softened. You can add a bit of salt to help the process along. Remove from pot and set aside. Deglaze the bottom of pot with red wine and allow to simmer and reduce for 5 min. Add back vegetables and nestle the short ribs in the vegetables. 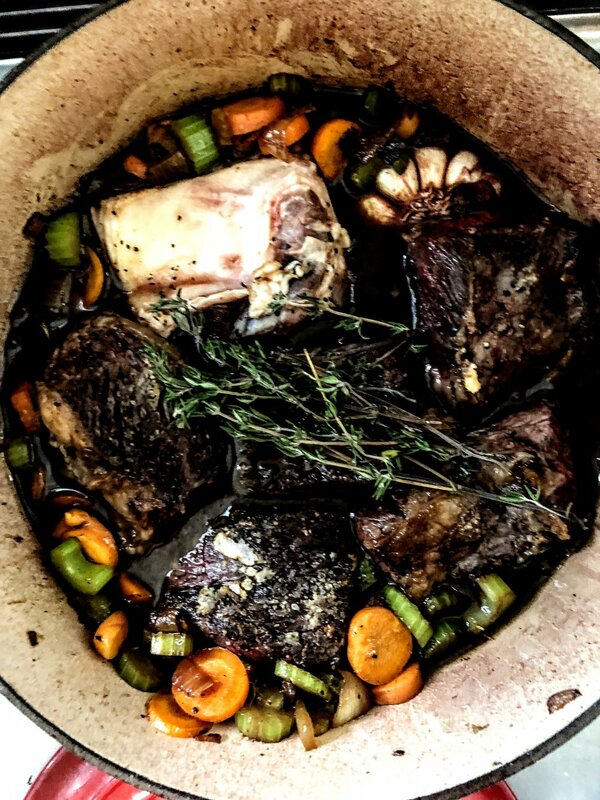 Add enough broth to cover the short ribs and add herbs to the top. Cover and bring to a simmer. Reduce heat to low and cook 3-4 hours at a soft simmer or put everything into slow cooker and do the same. Serve when short ribs are falling off bone and tender. Remove short ribs and veg and add salt and pepper to gravy to taste. If you want to thicken, sprinkle a tsp of cornstarch or flour and stir at a simmer until desired thickness. Plate veg then a short rib or two on top and drizzle the gravy all over.